Porsche Design Tower and Porsche Centre at the Pragsattel. Porsche Design Tower with office space, exclusive hotel, gastronomy and terraces. 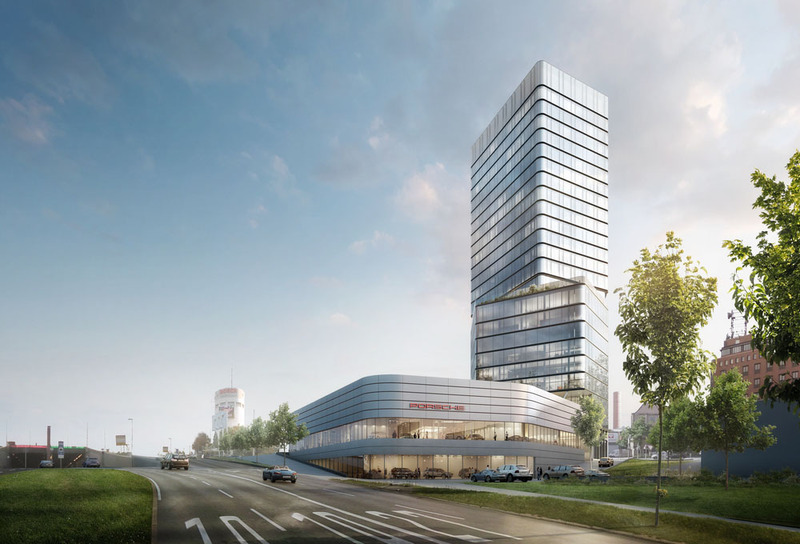 New building project of Porsche and Porsche Design in Stuttgart: together with its subsidiary, the sports car manufacturer is planning to build a Porsche Design Tower and a new Porsche Centre directly at the Pragsattel, an important traffic hub in the north of the city. The planning application will be submitted on 21st December. The idea is to start construction already in the first half of 2019. The company estimates that construction of the Porsche Centre will take two and a half years, and the tower should be completed around one year later. “With this building project at the Pragsattel, we are creating a landmark for Porsche in our home city of Stuttgart. With its height of around 90 metres, the Porsche Design Tower will be one of the tallest office and residential buildings in Stuttgart and will enrich the cityscape with its timeless architecture,” says Lutz Meschke, Deputy CEO of Porsche AG and Chairman of the Advisory Board of Porsche Design Group.